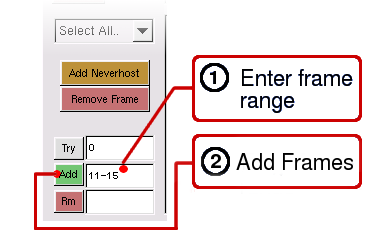 A. Multiple-Select a group of frames, and hit the "Remove Frame" button. B. 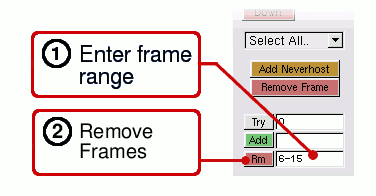 Enter the Frame Range and hit the "Rm" button next to the input box. You can edit most of a job's attributes on the fly while the job is running. This will open the Job Edit window. though the functions are still the same. In this screen, you can change the data, and hit 'OK' to make the changes take effect. Hit the "OK" button in the lower right-hand corner to make the changes take effect. The Jobedit screen will then close, and you will be returned to the main irush screen. Note: If you see this error dialog when hitting 'Done', enable the 'FU' button in the irush screen, then hit 'Done' again. Hit the "Cpus" buttons under Reports, to view the updated Cpus report. You can remove cpus from an existing job at any time either from the 'Cpus' report (using the 'Remove Cpus' button), or through the Job Edit window. If the cpus happen to be busy rendering when you remove them, the renders will be killed, and the frames requeued to other processors. To remove cpus from the 'Cpus' report, click 'Cpus', highlight the cpus you want to remove from your job, then hit 'Remove Cpus'. This will remove cpus only from the 'current job', not any other jobs. Note: If you see this error dialog when hitting 'Done', then follow these instructions to override. When you refresh the 'Cpus' report, you will see the cpus have been removed. Click on an empty bar at the top of a particular column you wish to sort. With subsequent clicks you can toggle between ascending & descending order. The buttons are 'three-state': 'Sort Up', 'Sort Down' and 'Sort Off'. The field you have selected will be 'remembered', even between executions of irush. (This info is saved in your ~/.irushrc file). To disable sorting, keep clicking the sort button until it turns off. You can change the priority for the cpus in an existing job at any time (even while the job is rendering) through the Cpus report screen. 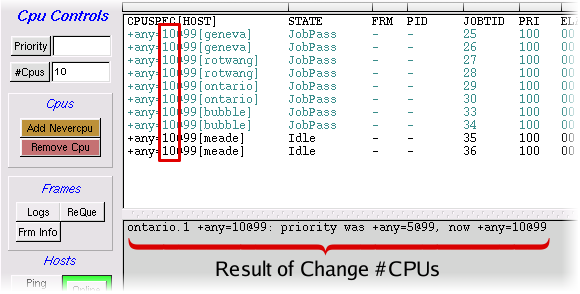 ..which will change the priority of the cpus you selected. You can change the cpu caps for the cpus of an existing job at any time through the Cpus report screen. First display the list of Cpus, to see what the current values are set to. Hit the "Cpus" button under Reports. 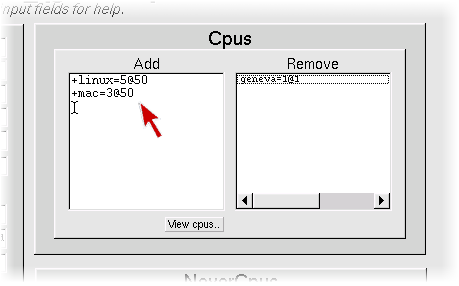 Here, we see the +any group is capped at 5; no more than 5 cpus will be used for rendering at any given time for this +any group. Here, we want to change the number of cpus from 5 to 10. 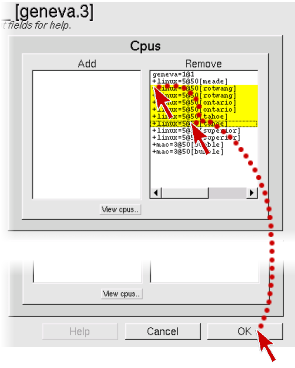 Select the first CPU entry in that group (it is only necessary to select one), and enter a new value of 10 in the "Change #Cpus" box, then hit the "Change #Cpus" button to apply the change. You can set up the function keys on your keyboard to invoke your own custom commands from within irush. For instance, to invoke a submit script with a single keypress, or easily view an animation sequence. 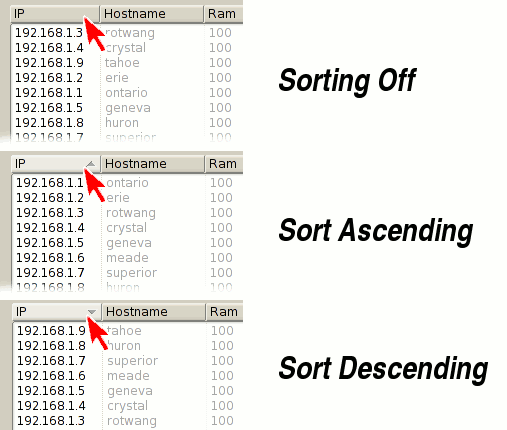 2) Hit 'New' to define a new command. 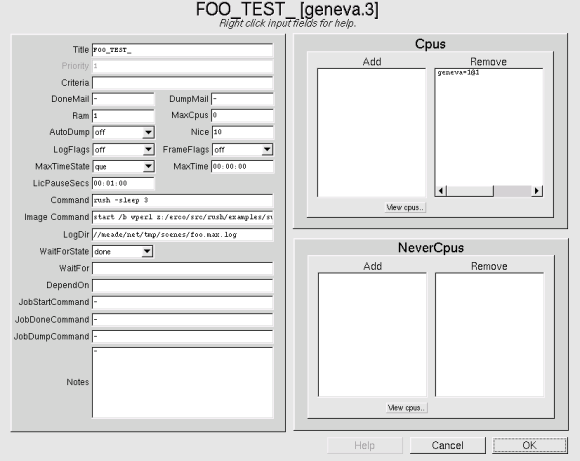 6) Choose which "Output" window the command will be sent to. 7) Hit 'Done'. That's it! Now, when you're in irush, just hit that function key to invoke your command. By default, your command's output will be sent to the 'Lower' gray irush terminal screen (Output: Lower), but you can change it to use eg. 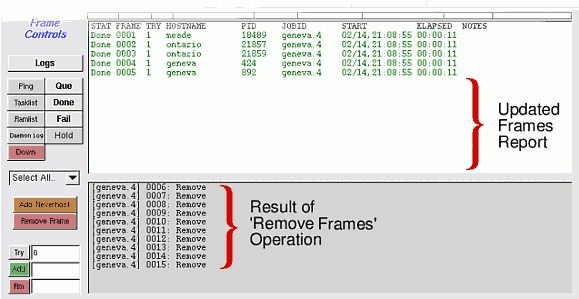 'Upper:Jobs' (shown above) which will use the upper "white" irush screen, showing the "Job Controls" at the left, allowing the user to highlight your report, and do 'Job' operations on it. Be sure your report format matches the controls you select for the "Output:" field; if you choose "Upper:Jobs", your report must have the same columnar format as the regular "Jobs" report. Creating shortcuts to irush is easy on all the platforms; Windows, Mac/OSX, Linux, Irix. Right click on the desktop, choose New | Shortcut. Change settings as shown above. To run irush, double click on the icon. In the finder, click on Go | Go to Folder. Hold down Alt-Apple keys while dragging the icon to your Desktop. To run irush, double click on the new icon. Right click on the KDE desktop, choose Create New | Link to Application. Your mileage may vary, due to the variety of window managers available. Example shows RedHat 7.2 / KDE. In the toolbox, click on Desktop | Home Directory. Navigate to the /usr/local/rush/bin directory. Drag and drop the irush to your desktop. 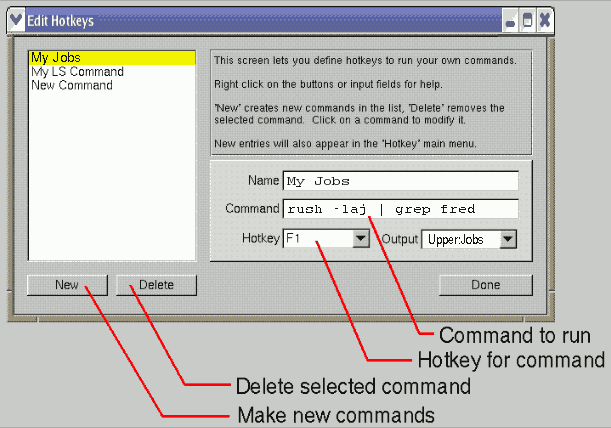 You can bring up Irush by just typing 'irush' on the command line, and then navigate to a job by hitting 'Jobs' or 'All Jobs', then double-clicking on one of the jobs to make it the 'current job'. Then hit 'Frames' to view the frames report for the job, etc. irush tahoe.15 -button Frames -title "My Job"
See 'irush -help' for more info. Commands such as these will work in both Unix and DOS shells, or invoked from within scripts. You Are Not The Owner? This error dialog indicates you are not the owner of the job. To override this error (if your sysadmin has enabled your permission to do so), enable the Force User ("FU") button in the irush window, then hit 'Done' in the Job Edit window to complete your changes.